Rouge was one of four young peregrines introduced to Richmond Hill in the summer of 1999 through the Canadian Peregrine Foundation's Project Release. He and his three brothers were released from the hack box on June 28, and gradually began to acquire the skills required for independence over the course of July and August. After a couple of months without any trouble, Rouge suffered an injury in early September and was kept in captivity for a couple of weeks to convalesce. He was returned to Richmond Hill for release on September 20, and unlike his brothers decided not to migrate south for the winter. Reports on Rouge's travels can be found below, in part, and also on both the Richmond Hill and Scarborough home pages. It is unlikely that Rouge will find a mate and breed this spring, as peregrines normally wait until they are at least two years old to raise a family. The next few weeks should give us an indication of whether Rouge intends to stay around Richmond Hill and defend the Town Hall (and our hack box) as his territory, or instead wander off in search of a mate elsewhere. Please check the news page regularly for information about when and where future news about Rouge can be found. February 8, 2000: 43.8N, 79.4W. Alan Kirschbaum reports: I took a trip around the Town Hall on Saturday February 5 and saw Rouge on the L of the Convention Centre. It was snowing and he looked a little puffed up. It was nice to see him and my family was with me so we all had a good look. January 26, 2000: 43.8N, 79.4W. The outcome of Rouge's latest excursion was no different than any other. He was seen at the Leslie Spit only on January 10, and by the middle of the week he was back on the Richmond Hill Town Hall, at his usual perch on the southeast corner of the roof. Over the last couple of weeks there have been periodic sightings of him at the Town Hall, and a couple of potential sightings of him reported from other parts of town. So for the time being at least, he is back in Richmond Hill, but it's clear that we can't make any predictions yet about what he will do come spring. January 10, 2000: 43.6N, 79.4W. Sure enough, Rouge has decided to travel again now that he is no longer wearing his satellite transmitter. From mid-November until almost Christmas, Rouge seemed to remain put in Richmond Hill, and we thought that he had really settled in. But yesterday he was back on the Toronto waterfront, near where he had visited three months ago on October 7. While participating in the annual Lake Ontario Midwinter Waterfowl Inventory, John Carley discovered Rouge on the grounds of the sewage treatment plant at the base of the Leslie Spit (also known as Tommy Thompson Park). The bird was seen at close range, and his leg band could be read easily, allowing for Rouge's identity to be confirmed. Rouge was perched on a lamp post, and twice swooped down to "attack" a scrap of paper towel or kleenex that was stuck on the ground. A short while later he was rediscovered on the roof of a nearby shed. A couple of pigeons were perched on a beam just under the roof, but Rouge didn't seem to pay any attention to them, just as they were not visibly concerned by his proximity. Rouge remains an enigma. Obviously he is hunting well on his own, yet he still enjoys play-hunting as well. Most of the time he is content to remain in Richmond Hill, presumably considering that it is his territory, but on occasion he continues to make excursions like this away from home. Maybe he still is looking for a "better" place to establish himself come spring. As for the short term, it's anyone's guess where he'll go next. He could stay around the Leslie Spit for a while, as there is plenty of food available there - nearby is Toronto's largest starling roost (over 15000 birds), and there are also many pigeons and a wide variety of ducks for him to hunt. But if he follows tradition, he could be back at Richmond Hill very shortly. Please help us keep track of his movements - if you see a peregrine that you think might be Rouge, please report the details to us (remember that he no longer wears the antenna and therefore looks like any other immature peregrine). December 22, 1999: 43.8N, 79.4W. Today another episode in the varied life of Rouge unfolded. Over the past couple of days, a couple of observers had noticed that Rouge's satellite transmitter was no longer visible. At first we were worried that it had fallen off, but this proved not to be the case. Instead, the antenna had been bent considerably out of shape - rather than arcing away from the back, it was almost parallel with the back, and the tip of the antenna protruded through the tail feathers when he perched. The cable of which the antenna is made is very difficult to bend out of shape, so it's hard to imagine what could have possibly happened with Rouge. It's possible that he became trapped somewhere, and bent the antenna in trying to extricate himself. In the process, he also loosened one of the neoprene patches protecting his breast from the harness. Given that the transmitter was likely damaged, its new position risked interfering with the flight of the bird, and the breast feathers had been disturbed, we decided to trap Rouge and remove the transmitter. Mark Nash and Bruce Massey placed a thawed quail inside the hack box and Rouge quickly came to investigate. The transmitter was quickly removed, and will be sent for analysis and repair. Rouge himself was in good condition, and very feisty. His breast feathers were straightened out, and then Rouge was released again. Rouge has now stayed in Richmond Hill well into the winter, and it's likely that he won't migrate at this time. However, as spring approaches, he may begin to wander in search of a territory - or else become increasingly vigorous in defending the Richmond Hill Town Hall as his territory. Now that we are no longer able to follow his movements by satellite, we will be relying on eyewitness reports to keep track of Rouge. Please e-mail us any sightings of Rouge (or any other peregrines) in Richmond Hill or elsewhere. December 20, 1999: 43.8N, 79.4W. On Saturday December 18, the Richmond Hill Naturalists conducted their annual Christmas Bird Count, and Rouge became the first peregrine seen during this event since 1968 (and only the third ever). As usual, he was found in the area of the Town Hall. Mark Nash also observed him there on Friday, and again around 3 pm on Sunday afternoon. December 15, 1999: 43.8N, 79.4W. Yes, despite the ever-nearing onset of winter, our feathered friend Rouge remains in Richmond Hill. Yesterday morning Mark Nash observed him perched on the Town Hall building again. We haven't had a satellite transmission since December 5, and the previous one was ten days earlier, so it would appear his transmitter has switched to the winter cycle (there should be another report from the satellite later today or tomorrow). December 6, 1999: 43.8N, 79.4W. No change - the latest satellite readings indicate that Rouge is still in Richmond Hill. November 24, 1999: 43.8N, 79.4W. Sure enough, Rouge changed his mind and returned to Richmond Hill yet again. He was reported by an observer in Markham on Saturday November 20, and satellite data the next day confirmed he was back at the Town Hall. Then on November 22, Bill Green and I were standing below the Town Hall when Rouge swooped past overhead and landed on the first "L" of the Richmond Hill sign on the south side. I could have sworn he gave us a little wink from up there before flying off again. I suppose there's still a chance that he will decide to leave when it gets really cold and the snow begins to fall, but I'm really doubting that now - it looks like he's here to stay after all. November 17, 1999: 43.6N, 79.1W. Just as I thought Rouge had settled down, he has set off on another little adventure. Yesterday we received three clear readings from him, each of which was accurate to within one kilometre. Shortly after noon, Rouge was pretty much due east of the Richmond Hill Town Hall, near the village of Whitevale in Durham Region. From there, he headed northeast, back toward the Lake Scugog area he visited just over a month ago. But for whatever reason, he then quickly changed his mind and turned to the south. By mid-afternoon, he was out over Lake Ontario, a little over 10 kilometres offshore. October 27, 1999: 43.8N, 79.4W. Rouge remains in Richmond Hill. We have again confirmed his presence both in person, and via the satellite transmissions. His behaviour remains unchanged, and there is no indication that he will all of a sudden be struck with the urge to leave. October 23, 1999: 43.8N, 79.4W. Once again, Rouge has made a short excursion, only to return to Richmond Hill. The first transmission we received from him this morning indicated that he was in the area of Caledon, ~40 km west of Richmond Hill. But by mid-morning he was already back near the Town Hall - this was confirmed both by the satellite data, and by Bruce Massey, who happened to be in the area and saw Rouge perched for a while on the Radisson Hotel east of the Town Hall, and then flying low over some of the old fields in the area. October 19, 1999: 43.8N, 79.5W. This time Rouge has chosen to wander off to the west. He has already made forays to the south (Toronto Islands), southeast (Cranberry Marsh), and northeast (Woodville), but returned home to Richmond Hill after each excursion. We will have to wait and see whether this pattern holds true again for this trip. The coordinates we received for Rouge tonight place him near the town of Maple, and more specifically, it would appear that he is in the area of Canada's Wonderland, a large amusement park. Near the centre of the park is a large artificial mountain - perhaps Rouge has been attracted to this "cliff". October 18, 1999: 43.8N, 79.4W. Once again, Rouge has returned home to Richmond Hill! We don't know when he came back, but he was perched on the Town Hall as of 5 pm today. We subsequently observed him making several flights around the neighbourhood, and he was close enough on a couple of occasions that we could clearly read his leg band. Obviously this bird has quite the homing instinct to keep coming back to this location. While on the roof, we also discovered some evidence that Rouge has been doing some of his hunting locally. On the southeast corner of the roof parapet, there was a fresh Blue Jay head. October 16, 1999: 44.4N, 79.0W. For the first part of yesterday, Rouge remained near home in Richmond Hill. But then the desire to wander seemed to hit him, and by the evening he was 50+ km to the northeast. The settlement closest to his latest location is Woodville, a small town of approximately 600 residents, located roughly 20 km west of Lindsay, and almost 20 km north of Lake Scugog. Given that the satellite reading really just gives us a snapshot in time, it's very possible that Rouge was simply passing by this area when the transmission occurred, and did not linger. Why he was heading northeast is of course a puzzle to us. We are quickly learning that these peregrines don't seem to have an over-riding instinct to go south. It will be very interesting to see where Rouge ends up next - will he head back to Richmond Hill yet again, or will he keep flying away? October 14, 1999: Observers watching the raptor migration at Cranberry Marsh in Whitby and Corner Marsh in Ajax saw Rouge on October 11. Around 8:50 am, a juvenile peregrine with an antenna clearly visible on its back flew past the Cranberry Marsh lookout, heading west. Then at 12:15 pm, it was seen a few kilometres to the west at Corner Marsh, this time heading east. Since Eco and Nate are already far to the south, and there are no other peregrines around wearing transmitters (to the best of our knowledge), the bird seen must have been Rouge. It would therefore appear that he took a bit of a detour to the east on his way back to Richmond Hill from the Toronto lakeshore. Thanks to Doug Lockrey for reporting these sightings. October 11, 1999: 43.8N, 79.4W. Apparently Rouge wasn't enamoured with life away from home, and decided to come back to Richmond Hill! In fact, his coordinates today place him very near the Town Hall itself. How long he will remain here this time around is anyone's guess, but we hope that his migratory urge will become stronger in the near future. October 7, 1999: 43.6N, 79.5W. Unlike his brothers Eco and Nate, who quickly went a long distance when they finally decided to leave home, Rouge has started his travels much more modestly. The three readings we received from his transmitter today were in the area of the Toronto Harbour, ranging from the Leslie Spit in the east to the City Centre Airport in the west. His average location was around Centre Island on the Toronto Islands (see purple dot on the map at right). September 30, 1999: 43.8N, 79.4W. Rouge is still sticking close to home. 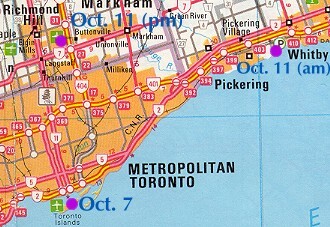 Recent satellite data indicates that he is ranging slightly to the east and west along Highway 7, but remains centred around the Richmond Hill Town Hall (see purple dot on the Greater Toronto Area map at right). September 22, 1999: 43.8N, 79.4W. New data has come in from the Argos satellite. As of yesterday evening, Rouge is sticking close to home in Richmond Hill. We will continue to feed him for the next little while until we are confident that he is hunting regularly again. September 20, 1999: 43.8N, 79.4W. Rouge is back home in Richmond Hill after a two-week stay at the University of Guelph's Wild Bird Clinic and the Mountsberg Wildlife Centre. His transmitter is working fine, and we expect to receive updates from him roughly every four days for the next couple of months. Watch here for updates. For reports on Rouge during his first few months of flight before leaving home, see the Richmond Hill Home Page.